“Drill is the bedrock of discipline” and the Drill square is often compared to a potter’s yard, wherein clay of various hues and textures are shaped into commendable works of art; each piece unique in itself and yet part of a whole. Passing the Drill Square Test (DST) entitles every cadet to the two ‘Ls’ he craves for; the Lanyard and Liberty. Here the ‘Liberty’ is a pass to go out of the Academy on a Sunday. Every Defence Service Officer would always remember their Drill Instructors – the Havildar Majors (Sergeant Majors) and Subedars (Warrant Officers) – who taught them the basics of drill. These Drill Instructors have to constantly maintain a high standard of military bearing and a super intense level of performance while they are training Officer Cadets. They are always under the microscopic eye of the Cadets. They are in a competitive environment against other Drill Instructors of other Squadrons/ Companies to ensure that their Squadron/ Company emerge as champions at drill in the Academy competitions. Above all, they take on a huge challenge to accomplish, making soldiers out of raw teenagers, coming from different parts of the country, speaking different languages (I could hardly understand Hindi when I joined the Academy), from different family/educational backgrounds. There is a lot of prestige associated with being a Drill Instructor at the Academy. The training to become a Drill Instructor is tough and the job has long hours and can be extremely demanding. These Instructors, mostly from the Infantry Battalions, are real go-getters and are always looking for opportunities to push themselves. It is one of the highest honours a Non-Commissioned Officer (NCO)of the Indian Army can get. Only the most qualified NCOs are chosen to attend Drill Instructor Course and from them the cream is selected to be appointed at the Academies. The Drill Instructors train the Cadets under the watchful eyes of the Drill Subedar Major (Master Warrant Officer) and the Adjutant of the Academy has the overall responsibility for the Drill Training. Our course-mates stationed at Mumbai organised a get together on 26 February 2016, to honour our Drill Subedar Major(SM), now Honorary Captain Ghuman Sinh. He was the first Drill SM when we joined the Academy and he was the best Drill SM I have come across in life. As a cadet both at the National Defence Academy (NDA) and at the Indian Military Academy (IMA), I had seen a few more, but he was easily the best. He had a roaring thunderous voice at the Drill-Square, but had the softest tone elsewhere. He had mesmerisingly penetrating blood-shot eyes at the Drill-Square, which metamorphosed into large pools of kindness when outside the square. He was surely a soldier to the hilt, perfect with his drill and above all a great Guru. One Sunday morning, cycling my way to the Church, (the route was through the Drill Instructors’ Quarters), I met a soft-spoken, humane person, dressed in his civvies, waiting with the NDA cycle near the church. He inquired as to where I was off all alone in a hurry. I said I was off to the church and the mass was to commence in about ten minutes. This person I knew from his bearing and being with the NDA cycle was a Drill Instructor and he spoke to me with a lot of compassion, care and love ( for NDA Cadets, it’s a rare experience). At the end of the conversation, I bid goodbye to him and assuming that he might be a recently posted Drill Instructor, my last question was – “By the way who are you?” The man said “I am your Drill SM Ghuman Sinh”. I just could not believe my ears and eyes, as the man in the civvies was really humane and I had seen him only in his military uniform until then. 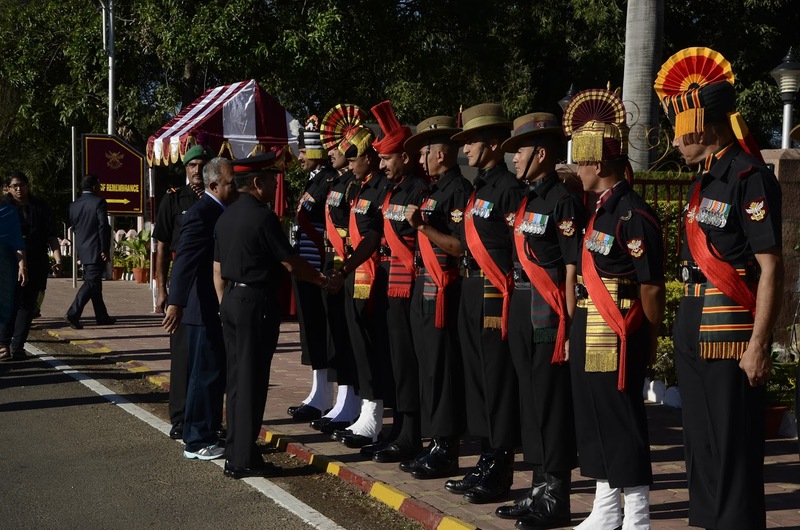 At the NDA, in Echo Squadron, we had Subedar Kalyan Chand from the Dogra Regiment as the chief Drill Instructor with Regimental Havildar Major Karnail Singh Chauhan from the Para Commandos as his deputy. They were really good at their job, thoroughly professional and real hard-task masters. Two years after my Academy Training, as a Lieutenant, I was leading the Artillery Brigade Athletic team for a competition at Dehradun. On reaching the ground for the march-past, I realised that a button was about to come off my blazer and I needed a needle and thread to fasten it. I looked around and saw SM Kalyan Chand there. He, a roaring salute. me, a bear hug! I then requested him for the much needed needle and thread. The service came in no time, but SM Kalyan Chand insisted on fixing the button himself. He said that it would be a matter of honour for him to do the favours for his cadet. I was pleasantly taken aback by his kind gesture. In 1990, our Regiment moved to Udhampur and was co-located with a Para Commando Battalion. An officer from the battalion was my neighbour and while conversing with him he said that their SM was Karnail Singh Chauhan. Next day I walked into the SM’s office and he could immediately recognise me. He introduced me to all the Havildar Majors of his battalion who had assembled there as “My Cadet at the NDA, now a Major in the neighbouring Artillery Regiment.” After that the two units developed such a great rapport that they would help each other with troops, vehicles and other resources whenever needed. 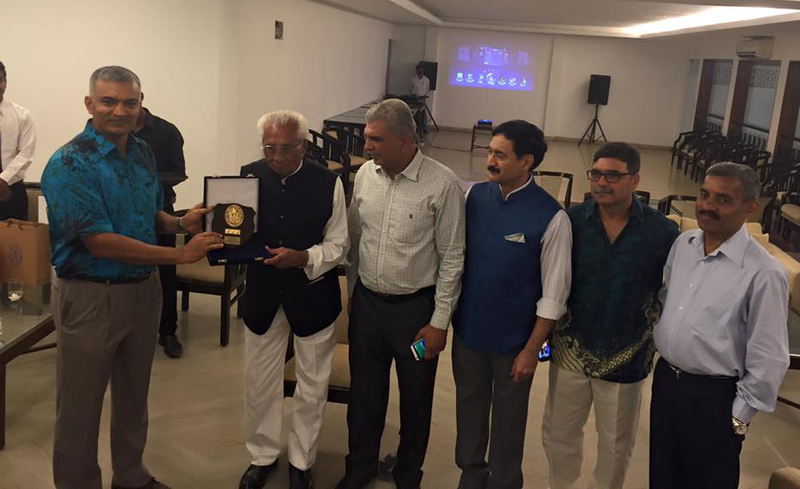 Our classmates’ from the 1979 batch of Sainik School Amaravathinagar had a reunion at the NDA on 22 December 2015. It commenced with the wreath laying ceremony at the Hut of Remembrance, to pay homage to the martyred officers, who had passed out of NDA. The solemn ceremony was an acknowledgement of the courage, valour and sacrifice of those who served the country. The ceremony had a patriotic impact on everyone present, especially the children. The Drill Instructors (Havildar Majors) provided an excellent ceremonial guard for the occasion. At the end of the ceremony, I thanked them and spoke to them to say that the Drill Instructors at the Academies are the most blessed lot of Gurus as they are the only ones to see their wards placed above them on completion of training under them. 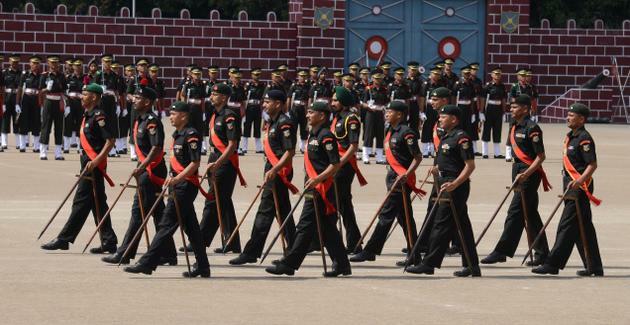 Hence, they are doing the most divine job and must always strive to impart the best Drill education to the cadets. Every word uttered by the drill ustads, their every action, every mannerism and every quirk is subject to intense scrutiny by the hapless cadets. And yet, they are most fondly remembered. We had our (drill) version at the school ! practice …. Practice endless times , reminiscing back just wonderful feeling now not exactly felt the same while you were at it at school !!! well written Reji ! You have captured the very essence of the complete training in the drill square. I agree fully with you Ghumman Sinh was the best and the guys in Mumbai have done a great job in getting him over and honouring him. Hi Reji Hon Capt Guman Singh was in NDA whereas I took commission from IMA. We spent one year with fellow from NDA. I never met the legend till in the felicitation party. Aim of commenting on this beautiful blog is that despite my first meeting I have probably same respect for him. Thats what great instructors are. Respect and respect. Yes Reji, he is a legend. Was our SM from 1st to 6 th term. Salute. Well written. Bringing old memories of DST and the lanyard. Reji, great recount and recall. 1970-71, had a SM called Kanshi Ram, tall with a stentorian voice. In spring term 1970(1st term), met him face to face in the drill test finals. There were ten of us and he cleared 3 of us to cross the Rubicon. Sweat and tears literally. He surprised us by speaking to us softly after passing us. Told us not to be ashamed of shedding tears for having achieved something important. Then ‘Baye mud, dhoudke chal. Drill Square clear karne thak test baki hai’. Rest is history. The armband 8812 was archived. Hi Reji, very well written as always. You have made me nostalgic about my Drill Instrs, a Hav from Madras Regt. By God what a fellow he was !! PERFECT. I am privy to your Udhampur Experience with Para Cdo Bn. Very helpful indeed. Once during Adm Insp, Staff of Bde HQ got suspicious of our 2 Mile run results. All in excellent. They had a doubt that we had borrowed men from the paras. So I challenged them to repeat the test again the next day but with a rider which I can not mention here. But eventually the Staff backed out. So those were the days. Excellent Regi, many fond memories, after all we are Sqn types with just one course separating us . Very well written. Well said Reji. I still fondly remember the drill instructors- what fine soldiers they were ! And what a challenging job they had to turn the civilians into soldiers. Hats off to them. Drill is the essence of Military Service. It has it’s origins from the complex manuvres executed by ancient armies on the battlefield. Proficiency in drill of an army was an essential requirement to win victory in battle. The Romans, Greeks and later Armies won many a battle against disorganised armies which has not adopted the art of Battlefield Drill. In recent times too, Drill has a great relevance. Parade ground drill has its charm and relevance for Ceremonials and pageantry. Other drills such as the Gun Drill, Battle Drill are indispencible in modern warfare connecting the man with the machine. Smashing article Reji sir, sent a shudder remembering my Drill instructors, who were nothing less the SM Ghumman Sinh or SM Lynch. They tempered the steel well. They did their duty well. Salute and Kudos. Your words always fall in the right place just like a host of soldiers coming in their spick and span uniform. Lanyards and Liberty…. interesting. I was on my goosebumps when I read about the moments you had been with your old instructors. That’s the best tributes one can give to the instructors shaped them up. As usual, enjoyed your piece, Colonel. Keep smiling. Excellent article Reji. You took me down the memory lane to the NDA drill square. Sub Maj Ghuman Singh’s roar on the parade ground can never be forgotten. It is good to hear his word of comd once again in the video of your get together.